We’ve recently updated the way Teachworks allocates lesson payments to invoices, and we’ve added the option to refund payments partially or in full. While these are relatively minor changes, they should make managing payments and allocations much easier. With this new method, you can allocate lesson payments to invoices and if you need to unallocate a payment from an invoice for any reason, you can simply remove the allocation without removing and redoing the payment. After unallocating the payment from the invoice, the payment will be available for allocation to future invoices. 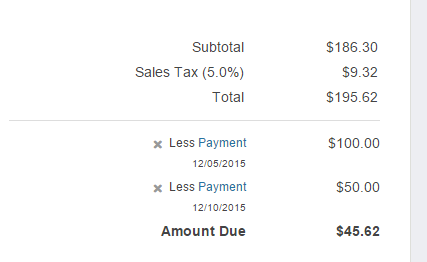 Payments applied to the invoice are displayed in the invoice totals section and will now display an “X” icon that allows you to unallocate that payment from the invoice. The payments table displays each payment transaction and includes an “Unallocated” column that allows you to see if any portion of the payment has not been allocated to an invoice. You can click the Unallocated heading to sort by balance to find easily find customers with unallocated payments. When viewing an individual payment you will see the payment details as well as a list of any invoices that the payment has been allocated to. You can also see any unallocated balance if the payment has not been fully allocated. You can now refund payments by going to the payment that needs to be refunded, clicking the “Options” menu in the upper right corner, and then clicking the “Refund” option. This opens a refund form that allows you to refund any amount up to the unallocated balance of the payment. 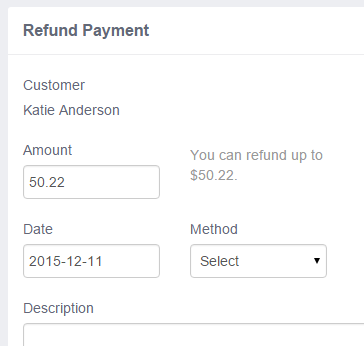 Once recorded a refund will be displayed in your Payments table as well as on the page displaying the payment that was refunded.